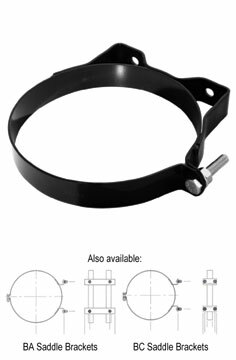 BB Band Brackets l Vortox Air Technology, Inc.
BB Band Brackets are a completely solid unit of steel welded together and designed for a universal fit. Two mounting holes allows mounting directly to any surface. Current models range from 5″-18″, but variations can be created upon request. Further customization capabilities include: band width and metal gauge thickness for added strength and support, placement of mounting holes, and placement of band closure. Vortox Air Technology, Inc. Band and Saddle Brackets are designed to efficiently and securely hold your application in place. Built entirely with heavy gauge steel, our Band and Saddle Brackets have the ability to support any application and stand the test of time. Customers have the option of choosing Carbon Steel or T304 Stainless Steel for construction material. Finishes available in painted black powder coat or polished Stainless Steel. Sizes currently offered range from 5″ to 18″. We welcome customization in band diametere and width (thickness), placement of mounting pilot holes and slots, and placement of band closure to avoid mounting difficulties due to obstructions.